This Arctic Club Hotel wedding photograph reveals that this wedding was all about family – both traditional and the furry kind. The groom’s dad officiated the wedding ceremony, and you get a glimpse of how happy and proud he is to do so, and the couple also snuck their beagle puppy into the no-pet-allowed hotel, dressed snappily in a tux, so that he could serve as the ring bearer. 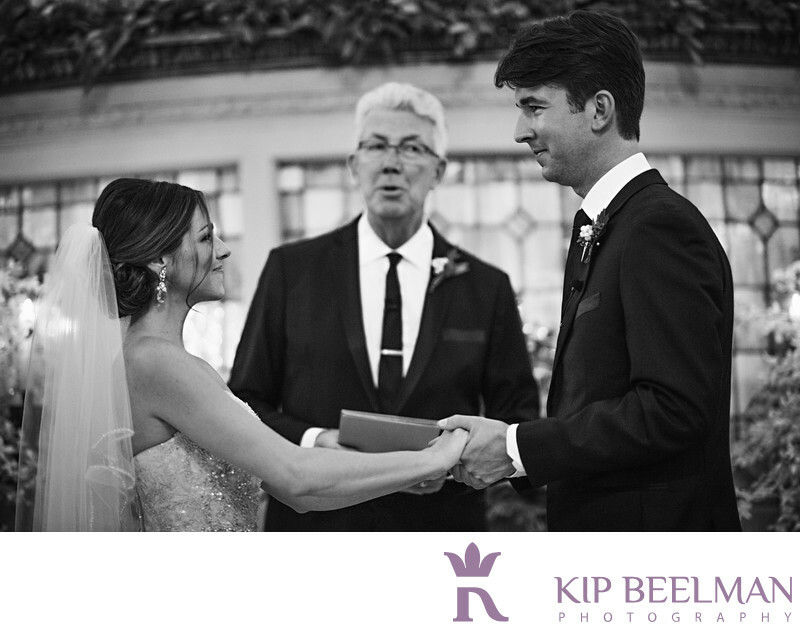 I love the focus, affection and excitement in this image just as the groom’s father is announcing the couple as husband and wife before inviting his son to kiss his bride. The fun began earlier in the day as everyone hopped in Big Woody in their wedding best. The Big Woody is the biggest, best special occasion party bus I’ve had the privilege to ride in, and on this day, the tunes blazed as we enjoyed several cool portrait stops around Seattle, including Occidental Square and the SoDo neighborhood. The wedding ceremony and reception both took place at the Arctic Club Hotel in downtown Seattle, which is famous for the walrus heads lining the building’s third floor and for serving as an amazing and historic luxury hotel and events space that really takes the cake for weddings. The incredible Michael Benson band provided ceremony piano, cocktail hour jazz duo, ambient lounge music during dinner and a full blown party band for dancing. From "I do" through the rest of the duo’s day and night (including their cute and frisky ring bearer), family and friends were more than happy to share in the beautiful celebration. Location: 700 3rd Ave, Seattle, WA 98104. Keywords: Arctic Club Hotel (6), Dome Room (6), Hotel Wedding (48), Low Light Wedding (12), Seattle (111).